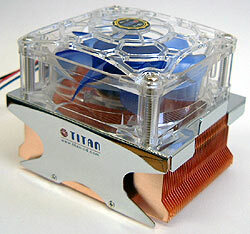 Slap on the chrome plating, a clear plastic fan grill, and a foundation made of copper and you have the basics for the brand-new CW9TB/SC Pentium 4 heatsink from Titan. As if that weren't enough already, the flashy cooler also ships with an expansion bracket fan speed controller. The idea of a fan speed controller attached somewhere to the chassis is good, but using an entire expansion bracket for this just seems a little counter-productive and inconvenient. Not only do users have to reach around back of the PC to fine tune the speed of the CW9TB/SC's fan, but they also loose access to one whole PCI expansion slot... not the best compromise in either case. It is a bit of a shame, seeing as the bracket is relatively well made too. Given that the Titan CW9TB/SC is based on a soldered joint between an interlocking fin assembly, and a copper base plate, the design seems to be one where we could expect pretty decent performance. Of course, as with all heatsinks where there is a solder interface between the fins and the base, you can never be to certain of how the cooler will perform before actually testing it out. If there are microscopic gaps in the solder flow, they can resist the flow of heat energy from the base up. From preliminary observations, the quality looks pretty good on the CW9TB/SC. I should also note right about now that the copper base has been polished to a mirror shine - which is all nice and good for lapping-enthusiats, but in the process, Titan destroyed any semblance of the machined flatness the base previously held. The result is more akin to a shiny bald head, than a shiny flat mirrored surface. More on this in a moment.